In this assignment, you will design a visualization for a small data set and provide a rigorous rationale for your design choices. You should in theory be ready to explain the contribution of every pixelin the display. You are free to use any graphics or charting tool you please--including drafting it by hand. However, you may find it most instructive to create the chart from scratch using a graphics API of your choice. After the World War II, antibiotics were considered as "wonder drugs", since they were easy remedy for what had been intractable ailments. To learn which drug worked most effectively for which bacterial infection, performance of the three most popular antibiotics on 16 bacteria were gathered. 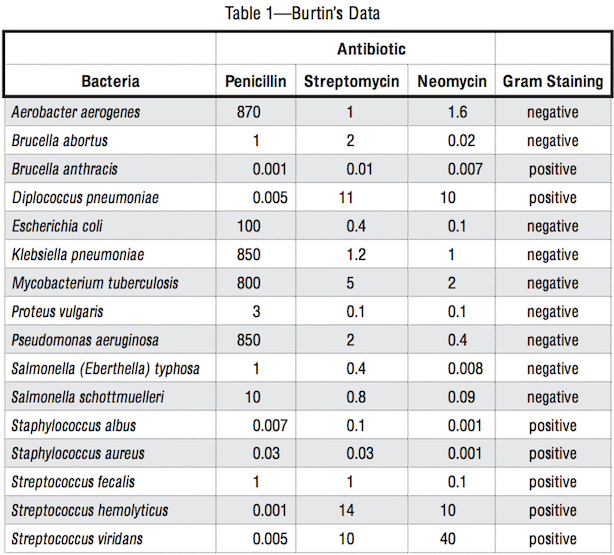 The values in the table represent the minimum inhibitory concentration (MIC), a measure of the effectiveness of the antibiotic, which represents the concentration of antibiotic required to prevent growth in vitro. The reaction of the bacteria to Gram staining is described by the covariate “gram staining”. Bacteria that are stained dark blue or violet are Gram-positive. Otherwise, they are Gram-negative. Your task is to design a static (i.e., single image) visualization that you believe effectively communicates the data and provide a short write-up (no more than 4 paragraphs) describing your design. While you must use the data set given, note that you are free to transform the data as you see fit. You are also free to incorporate external data as you see fit. Your chart image should be interpretable without recourse to your short write-up. Do not forget to include title, axis labels or legends as needed! As different visualizations can emphasize different aspects of a data set, you should document what aspects of the data you are attempting to most effectively communicate. In short, what story (or stories) are you trying to tell? Just as important, also note which aspects of the data might be obscured or down-played due to your visualization design. This is an individual assignment. You may not work in groups. Your completed assignment is due on Mon 1/13, by 5pm. We will be discussing submissions in class, so be sure to avoid a late submission! Submit a text file (.txt) describing the visualization and your design rationale (≤4 paragraphs) and a copy of your visualization in a standard image file format (JPG/PNG) via Catalyst Dropbox. If you are on the waitlist, submit these two files to cse512[at]cs.washington.edu.